Includes all three SEE IT. SAY IT. 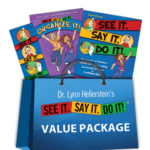 DO IT!® books so parents, educators, therapists, coaches, and athletes of all ages can apply Dr. Hellerstein’s powerful techniques at school, at home, and in sports. SEE IT. SAY IT. DO IT!® Organize It! Workbook – Author-therapists Beth I. Fishman-McCaffrey, Patricia Dunnigan, and Dr. Lynn F. Hellerstein present step-by-step strategies and organizational charts to help children organize daily routines, visualize goals, and create action plans. Tired of fighting the “homework battle” every night? There is a better way, and developing this skill is key to success in school, work, and life. SEE IT. SAY IT. 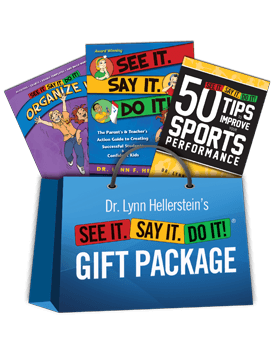 DO IT!® 50 Tips to Improve Your Sports Performance – Dr. Hellerstein presents this rich, handy resource for parents, kids, coaches, and adult athletes who want to improve their sports performance. Includes sports vision training techniques to boost the top 15 visual skills key to great sports performance, using visualization to enhance performance and mental readiness, and tips on sports vision safety. Handbook-sized, take it with you to practice. Exercises for individuals, teams, kids of all ages, and adults at every skill level. Be the first to review “SEE IT. SAY IT. DO IT!® Gift Package” Click here to cancel reply.